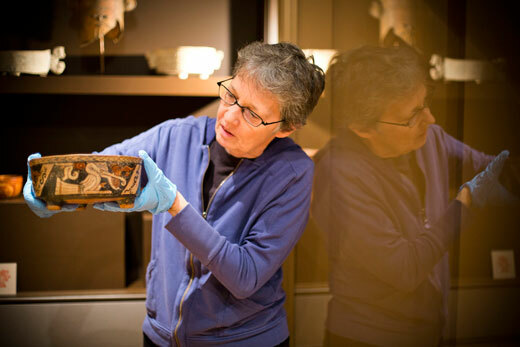 Nancy Roberts, director of exhibition design at the Carlos Museum, holds a Central American ceramic bowl from 650-750 AD. Emory Photo/Video. Rebecca Stone, faculty curator of Art of the Americas at the Carlos Museum, will give a talk and gallery tour of the newly-re-opened Art of the Americas galleries on Tuesday, Feb. 12 at 7:30 p.m.
Stone, who is also Masse-Martin/NEH Distinguished Professor of the Humanities and Professor of Art History, says her talk and tour "will highlight the new pieces not seen before here at Emory," such as items on loan, gifts and pieces formerly in storage. "As a university museum, the Carlos has a strong commitment to producing new knowledge, as well as displaying beautiful and interesting art from many of the world's cultures. "I could not be more excited to unveil these and many other discoveries when the galleries reopen," Stone adds. The talk and tour are free and open to the public. New discoveries, new works of art and new interpretive displays mark the re-opening of the Art of the Americas galleries at the Michael C. Carlos Museum on Feb. 9. Closed since mid-May 2012, the galleries re-open with over 460 works of art on display, spanning 4,000 years, from 2000 BC to the 20th century, from the plains of Mexico to the mountains of Peru. While there are no physical changes to the building this time around, some new wall cases have been added, including a 4 ft x 7 ft new textile display case, according to Faculty Curator of Art of the Americas at the Carlos Museum Rebecca Stone, who is the curator of this reinstallation. "It's been 10 years since the last reinstallation," says Stone, an art history professor. Now, the collections are expanding into Southwestern art, including Puebloan cultures, from antiquity to the present. "We hope to get a wide variety of Native North American art on loan from the University Museum at Penn in the next few years. We also are displaying more modern indigenous art." "Walking in the Footsteps of Our Ancestors: the Melion-Clum Collection of Modern Southwestern Pottery" is the title of a small exhibition of modern Southwestern ceramics, scheduled to run for the calendar year 2013. It will include seed pots, red- and black-ware, vessels inspired by basketry, and a large case of objects made by the famous Quezada family of potters from Mata Ortiz, Mexico. An additional case in the gallery will feature the Carlos' stunning Maria and Julian Martínez signed black-on-black vessel. More space is now devoted to Panamanian art, with a new textile display and a case of effigies and womb pots from Costa Rica. There are also several new cases of spectacular Colombian ceramics. For the first time, there are cross-cultural displays that put the objects into geographical context, illustrating similarities and differences between neighboring cultures. For example, Costa Rican works of art compared to Panamanian art have distinctly different styles in ceramics, but share similarities in gold work. Mexico and Costa Rica are also compared. The dynamic translation of art across cultures can also be seen in the transfer of visual imagery, for instance the hand axe in Mexico becomes a jewelry item in Costa Rica. "So much has shifted in what we know about our permanent collections," Stone notes. "This reinstallation of the art of the Americas emphasizes the research on the collection that I have done — along with my students — since 2000," she says. "We have poignant vessels in the shape of pregnant bellies that originally held the tiny skeletons of Costa Rican babies, hand-stitched modern Panamanian cloths whose patterns evoke those of the ancestors of the Olotule peoples and the X-rays of Colombian flutes in the shape of shells that show their makers copied the interiors of actual shells in order to reproduce their acoustics."